In a perfect world suspension would always react different on your bike. The first half of the spring would be supple and would react flexible so that small bumps and irregularities are absorbed. If the spring would be further compressed, the spring would become more stiff, so that even big bumps and holes in the road would be absorbed and wouldn’t let the shocks and fore forks fuse. However, for cost-efficiency reasons, new motorbiks are equipped with linear springs. Compressing the top half of this spring takes as much force as compressing the bottom half. The result is that the top of the spring is in fact too rigid and the bottom too supple. Fortunately, this perfect world exists. Hyperpro produces rising spring rate springs where the first part can be easily compressed, and where compression of the last part is much harder. Also, we design springs that fluently give you the comfortableness or the harness you need at the right time while riding the bike. Learn all about the benefits on this page! Using good suspension provides more safety on the bike and is one of the cheapest ways to optimize your motorcycle! Our products are supplied in “plug and play” kits with all information to install and adjust the supension of the specific motorcycle… your motorcycle! The front fork was designed to use the maximum front fork stroke, and to withstand heavy breaking so that it won’t disturb the front grip. 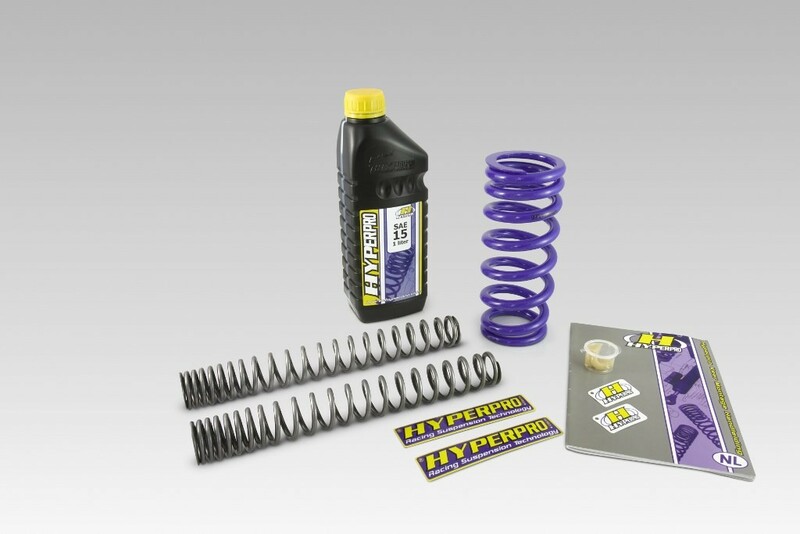 Our progressive spring kit is available with fork oil and a manual for adjustment instructions. Our progressive rear spring is designed to smoothly transfer engine power to the road whilst controlling your bike. This will ensure more stability and will significantly reduce tire wear. These springs are not only suitable on the track, but are also suitable on the road. It absorbs irregularities in the roads, and saves you from hitting the bump while transporting persons or heavy loads. Hyperpro supplies a specific rear spring that fits on your OEM shock. In this case when the shock still has damping and is not leaking, it is possible to exchange the “soft” original spring with a Hyperpro progressive rear spring. 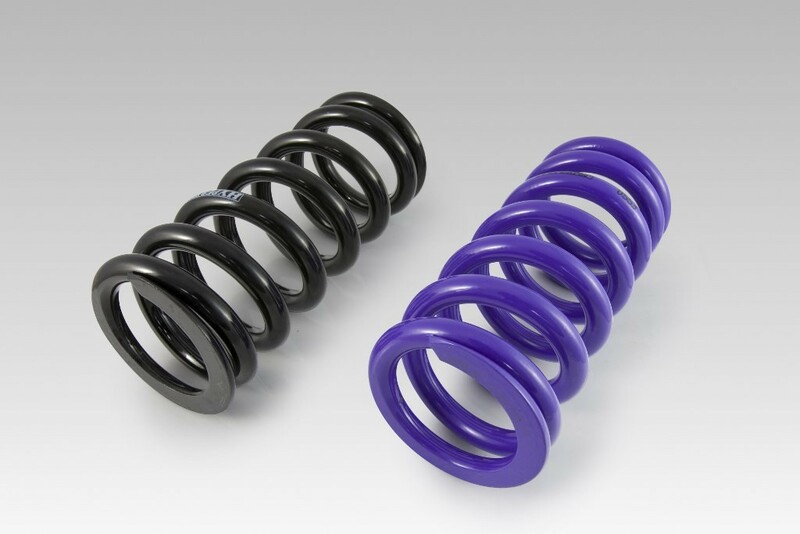 Rear springs are available in the colors Hyperpro Purple and Black. 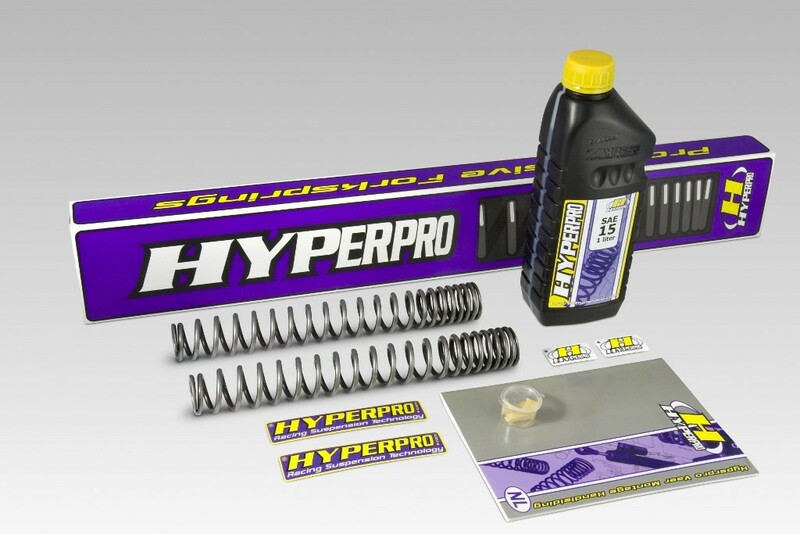 Combining the qualities of the front and rear spring kits, together with the full suspension set-up manual, the Hyperpro Combi Kit is the most cost-effective suspension improvement package that is available for your bike. With this combination you will reach in most cases an upgrade of your suspension of 80%, which is reachable. To gain the other 20%, we can offer a Hyperpro Shock, as you can see in the “Shocks” section of this website.